A simple solution for car reverse system! This system is suitable for many vehicles. With 7" TFT LCD Wide Screen, high-resolution picture, full color display and low power consumption. 1) 7" inch LCD color wide Screen monitor. 2) Can directly replace your original rearview mirror. High-resolution picture. 3) Delicate design, stable performance, clear picture and excellent color effect. 5) With high-resolution picture, full color display and low power consumption. 7) Support both key operation and remote control. Controlled by an IR remote control or by touching the screen buttons. 8) Wide range of application, suitable any kinds of vehicles. 9) Using high quality cable and high brightness backlight to improve clearness and last long. 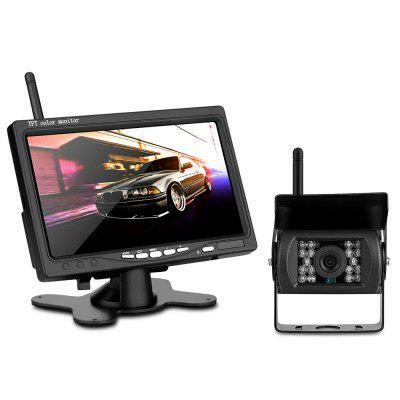 10) Camera body with bracket, easy to mount on any flat surface of the vehicle. Want to be notified when the WD - 780SY Car Rear View Set gets even cheaper? Make sure you snag the best price by entering your email below. We'll email you when the price drops, free! We're tracking the price of the WD - 780SY Car Rear View Set every day so you know if that deal is really a steal! Check back for to check the best price for this product - and whether its current sale price is really the cheapest it's been! No WD - 780SY Car Rear View Set coupons found!